CKD Galbraith and Hayes Macfarlane have today completed their merger that strengthens the expertise and network of Scotland’s leading independent property consultancy. Hayes Macfarlane, an established farm and estates management business with offices in Aberdeen and Alyth, has now become part of CKD Galbraith, creating an enlarged firm employing around 250 people. 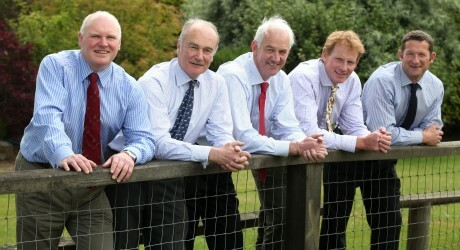 The merger adds to CKD Galbraith’s extensive presence across Scotland, with 14 offices located in Edinburgh, Stirling, Perth, Cupar, Inverness, Aberfeldy, Castle Douglas, Ayr, Elgin, Galashiels, Kelso, Peebles – and now Alyth and Aberdeen – that provide a comprehensive range of consultancy services spanning the property, agriculture and rural sectors. As part of the merger, Hayes Macfarlane partners Tom Stewart, Colin Stewart and Ian Hope become partners in CKD Galbraith and all other staff also transfer to the company. James Galbraith, chair of CKD Galbraith, said: “We are delighted to welcome the staff of Hayes Macfarlane to CKD Galbraith today. Tom Stewart, partner in charge of CKD Galbraith’s new Aberdeen office, said: “Hayes Macfarlane’s merger with CKD Galbraith has allowed us to join with the leading team of rural land and property specialists in Scotland. “Our business had a good reputation and we had already been approached on previous occasions by companies who wanted us to join them. “However, we wanted to wait until the correct opportunity presented itself and the merger with CKD Galbraith provided that. CKD Galbraith is a highly respected firm that shares the same ethos we had created at Hayes Macfarlane. The partnership provides the full range of property consulting services across the residential, commercial, rural and renewable energy sectors throughoutScotland. CKD Galbraith also enjoys a successful relationship with its associate firm inLondon, CKD Kennedy Macpherson. MEDIA RELEASE posted by Media House. You too can media releases (aka press releases) on allmediascotland.com. For more information, email here.